Note: The grant funds ($500) will be distributed as a reimbursement -- at the registration desk -- upon arrival at the conference. The fee for attending the conference includes admission to all presentations, conference materials, conference program, certificate of attendance, lunches and coffee-breaks. For papers written by more than one author to be presented, at least one of these authors must attend the conference. 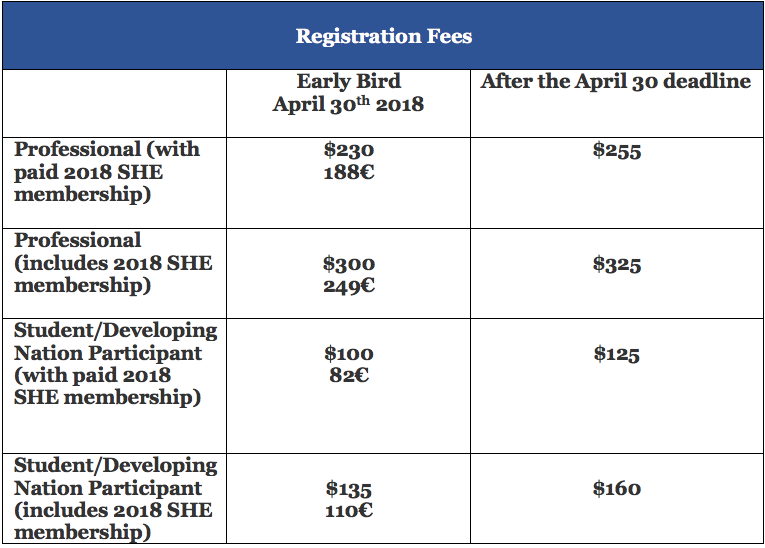 This fee does not include the Field Trip Registration nor the Congress Dinner, these are separate and optional and are considered contributions to these additional activities. More information about Field Trip and Congress Dinner soon. Each registration is individual, and is made for each person attending the conference. If you wish to bring an accompanying person(s) to either the Field Trip or the Congress Dinner, these fees do not cover their registration also, and must be done additionally, in which case the same fees will apply to each accompanying person(s).